^ Burns 2003, p. 111. ^ a b Burns 2003, p. 113. ^ Paul 2006. The previous topics are discussed in the section "Finding Sociology in everyday places: a review". ^ "tastes, preferences, and interests"
^ "attitudes, traits, norms, and needs"
^ Peterson 2006, pp. 173–175. ^ Cesvet, Babinski & Alper 2008, p. 68. ^ Voice of America 2004. ^ Cantor 2003, p. 76. ^ Nalebuff & Ayres 2006, pp. 115–118. ^ Freiberg & Freiberg 1998, p. 270. ^ The Daily Examiner 2009. ^ Ode 2010; Weingarten 2008; Keeran 1993. ^ Downey & Harrison 1993. ^ FitzSimons 2009, p. 99. ^ Scriven 1991, "EVALUATION SKILLS", pp. 151–153, especially p. 153 for the quotations. ^ a b Rubin 1989. ^ a b Oldenburg 1989. ^ Mark Wolf Scripps Howard News Service 1990. ^ Kanner 1995, pp. 56, 120. ^ a b PR Newswire 1993. ^ a b Ortega 1995. ^ a b Toronto Star staff and news services 1993. ^ a b Clark 1993. ^ American Standard Press 2008. ^ Poretz & Sinrod 1989, p. 34. ^ a b c d Floyd 1999. ^ a b Kimberly-Clark 2010. ^ Barrett & Mingo 2003, p. 400. ^ Buckley 2005, p. 106. ^ Breithaupt 2003, pp. 126, 135. ^ Wyman 2001, p. 61. ^ Wolf 1999, pp. 74–75; Hogan 2000, p. 200. ^ Lui 2009; Grant 1991a. ^ Daily Express 1999, p. 39. ^ a b Newman 2000. ^ Greenberg 2007, p. 149. ^ Hunt & Edwards 2000. ^ Walsh 1999; Marelius 1987. ^ Mitchell & Sugar 2005b. ^ Arkins 1994; Jarski & Jarski 2007. ^ Godfrey 2006, p. 103. ^ O'Connor 2005, pp. 2–3. ^ O'Connor 2005, pp. 63–64; Davis 2006. ^ a b Marelius 1987. ^ a b Toronto Star 1986. ^ The Oprah Winfrey Show 1996. ^ Welsh 2005; Rawson 2008. ^ Burns 2003, p. 116. 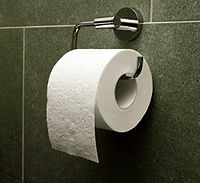 McNatt, Cindy (25 April 2010), “Small ways to go GREEN”, The Orange County Register, Factiva OCR0000020100503e64p0002t, "Planet Green says that if you hang your toilet paper roll so the paper comes out over the top, not from under, you'll save on toilet paper." Yeld, John (31 March 2010), “SMS feedback – March 31, 2010”, Cape Argus, Factiva MEWCAP0020100401e63v00011, http://www.capeargus.co.za/index.php?fArticleId=5412902, "A British loo paper manufacturer investigated whether it was more economical to run loo paper over the top or draw it from below. From below was the verdict." “Dingo – Fisherman's tale”, Centralian Advocate: p. 6, (7 May 2002), Factiva cadvoc0020021123dy57002nt, "A particularly fascinating response came from a reader who found a university in the US conducted a study into the most economical toilet paper use. 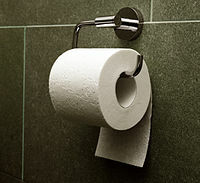 The six month study found that when the toilet paper came over the front of the roll less was used than if the paper was pulled from the back." References "a Reader's Digest poll". Primary source unclear. References a poll by Ric Hanson featured in USA Today. Mentions Bob Palmer of Denver's KCNC-TV doing a show on this topic. Presents a statistical test to determine gender differences in toilet paper orientation.